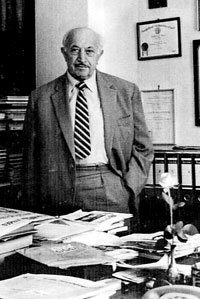 Wiesenthal lived in a modest apartment in Vienna and spent his evenings answering letters, studying books and files, and working on his stamp collection. He lived there with his wife Cyla until her death November 10, 2003. Wiesenthal was often asked to explain his motives for becoming a Nazi hunter. According to Clyde Farnsworth in the New York Times Magazine (February 2, 1964), Wiesenthal once spent the Sabbath at the home of a former Mauthausen inmate, now a well-to-do jewelry manufacturer. After dinner his host said, "Simon, if you had gone back to building houses, you'd be a millionaire. Why didn't you?" "You're a religious man," replied Wiesenthal. "You believe in God and life after death. I also believe. When we come to the other world and meet the millions of Jews who died in the camps and they ask us, 'What have you done? ', there will be many answers. You will say, 'I became a jeweler', Another will say, I have smuggled coffee and American cigarettes', Another will say, 'I built houses', But I will say, 'I didn't forget you'."